DeSilva+Phillips client, QD Healthcare Group, a Connecticut-based medical communications firm that provides scientific content development, promotional medical education and related marketing services to the pharmaceutical and biotechnology industry, has been acquired by High Road Capital Partners (www.highroadcap.com) portfolio company Dowden Health Media. Dowden Medical Communications Group (DMCG), which now includes QD Healthcare Group, provides technically oriented marketing services to pharmaceutical companies to educate physicians on appropriate uses of pharmaceutical products. 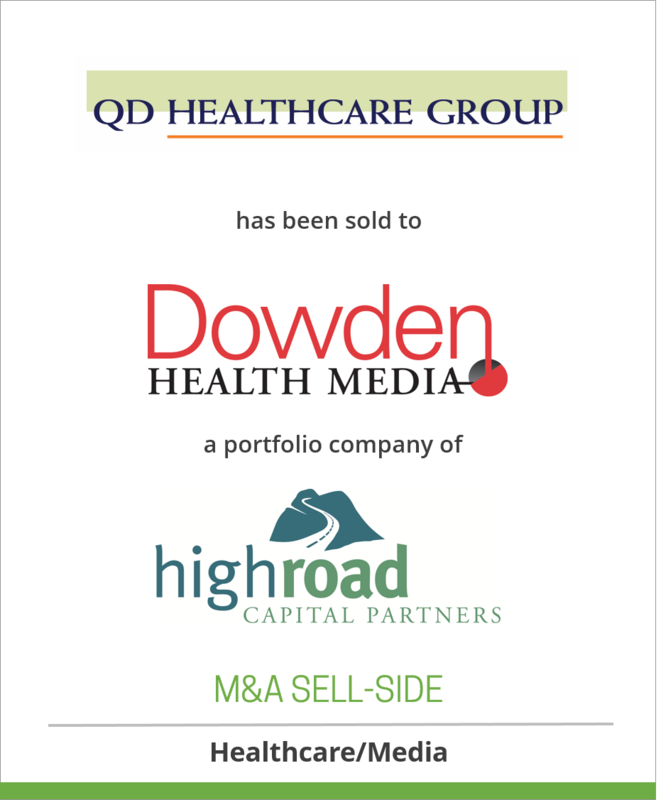 The QD Healthcare Group acquisition closed on November 13, 2012. Financing for the transaction was provided by Fifth Third Bank. Transaction consideration was not disclosed. Working on the transaction from High Road were Partner Jeffrey Goodrich, Principal Ben Schnakenberg, and Associate Paul Langley. High Road Capital Partners is a private equity firm focused on smaller middle market transactions. High Road was formed in 2007 and currently manages over $150 million of committed capital. High Road focuses on niche-leading companies with revenues of $10 million to $100 million and EBITDA of $3 million to $10 million. Once acquired, High Road works in partnership with management to take the companies to the next level through a combination of organic growth initiatives and add-on acquisitions. High Road has completed 18 transactions – eight platform investments and ten add-on acquisitions – for its debut fund, High Road Capital Partners Fund I, LP. For further information, please contact Jeff Goodrich of High Road Capital Partners at (212) 554-3268. More information on High Road may be found on its website, www.highroadcap.com. QD Healthcare Group provides scientific content development, promotional medical education and related marketing services to the pharmaceutical and biotechnology industry. QD Healthcare Group was founded in 1999 by Nick Kiratsous and Bradley Mock and is located in Stamford, Connecticut. Further information about QD Healthcare Group is available at http://www.qdhealthcare.com/.